Two years after parting ways due to differences over the Syrian civil war, Hamas is considering Iranian enticements to return to its embrace, according to recent Israeli intelligence assessments. In Gaza, where Hamas rose to power in 2007 through a violent coup against Fatah, Iran already has one very loyal proxy: Islamic Jihad. After Hamas, Islamic Jihad is the second largest terrorist entity in Gaza. The 5,000-man strong Islamic Jihad answers directly to Tehran, and has relied on it for funding, arms, and training for more than two decades. Hamas, which has 16,000 armed men in its ranks, was once firmly in Tehran's sphere of influence as well. Then, in 2011-12, it found itself on the opposite side of Iran on the question of the Syrian conflict, which has split the Muslim world. The civil war has caused many Sunni governments and non-state actors, Hamas among them, to turn against Iran and its war effort to rescue the Assad regime, a quest that has seen mass violence inflicted on Syria's Sunnis. Iran, in turn, expressed its displeasure with Hamas's failure to tow the party line, ended financial assistance, and reduced military aid. Yet this break in relations may yet be mended. 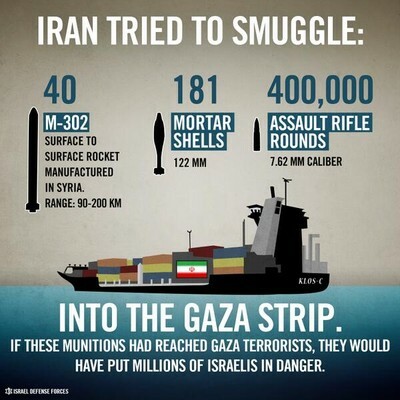 A recently intercepted Iranian arms shipment for Gaza, carrying powerful medium-range rockets, mortars, and nearly half a million rounds of ammunition, was meant for the Palestinian Islamic Jihad. But some in the Israeli defense establishment say some also was meant for Hamas, as bait to get it to rejoin Iran. Hamas finds itself entrapped and regionally isolated in ways that seemed unimaginable a year ago. In 2013, Hamas's sister movement in Egypt, the Muslim Brotherhood, was in power, and the Islamist government of Turkey made supporting Hamas a centerpiece of its regional policy. Today, under the leadership of Egypt's secular military government, Hamas is legally banned in Egypt, and is identified as an enemy of the state, just like its sister movement, the Muslim Brotherhood. Turkey, facing domestic turmoil, is less attentive to Hamas, according to intelligence assessments in Israel. And Hamas's attempt to hold a dialogue with the rival Palestinian Authority in the West Bank has floundered. This means that Hamas is, for all intents and purposes, on its own. As a result, it has begun exploring the idea of rejoining the Iranian axis, despite the risk of being ostracized in the Sunni world for such a move. Hamas recently dispatched delegation to Iran to discuss potentially rekindling relations. But Hamas is cautious about charging down this route, and for good reason. Should it significantly upgrade relations with Iran, Egypt will become even more hostile to it. Having the Arab's world largest and most influential state against it could threaten the stability of Hamas's rule in Gaza. Already, the Egyptians have managed to block "between 90 and 95 percent of [smuggling] tunnels to Gaza," according to Amos Gilad, the Israeli defense ministry's head of political-military affairs. This action has helped produce the worst cash crisis since Hamas rose to power, meaning that civil servants in Gaza are not being paid, and discontent is rising. Egypt could tighten its blockade of Gaza even further, leading to an economic crash. It could also make good on threats to carry out counter-terrorism operations in Gaza itself, where, according to Egypt, Islamist terrorists hide out before and after attacking many targets in the Sinai Peninsula. Hamas is walking a tightrope, and a dramatic turn in Iran's direction could upset the balance. On the other hand, none these crises has prevented Hamas and other terror groups in Gaza from embarking on an ambitious armament program, which continues to this day. With so many smuggling tunnels sealed, Hamas and Islamic Jihad have turned to domestic production of rockets, and seek to import the raw materials they need. Israel has been able to stop some, but not all, of this smuggling. "It's coming in at a pace I would describe as medium," a senior Israeli security source said recently. This has allowed Hamas to create dozens rockets it calls M75 (with a range of 75 kilometers), putting greater Tel Aviv and Jerusalem in range. In total, Hamas also has at least 5,000 short-range rockets according to Israeli estimates made last year. Islamic Jihad, for its part, has more than 2,000 rockets. The IDF is mapping out the location of these rockets, and is expected to strike the targets on the day that a major conflict with Gaza erupts. Against the background of these developments, and Israel's capture of the Iranian arms ship, recent days have seen a security flare-up on the Israel – Gaza border, led by Islamic Jihad, which fired over 60 rockets into southern Israel. The rocket attacks – the most widespread since Operation Pillar of Defense in 2012 – prompted the Israel Air Force to strike more than 30 targets in Gaza, most of them belonging to Islamic Jihad. Some security analysts see Iran's hidden hand behind the sudden escalation. Defense sources in Israel said Hamas was aware of Islamic Jihad's intentions to embark on a rocket offensive, and Israel threatened to strike Gaza's ruling regime if it did not put a stop to the attacks. Hamas's decision to green light Islamic Jihad's short-lived offensive may be a sign of a new Iranian wind blowing through Gaza. Hamas & Iran - time to make Kaboom! The Israelis should be reminded to hit Gaza at the same time they hit Iran because that's where the first response will come from - and I wish they'd get off their behinds and DO IT! It might be appropriate to hit Iran while Ashton is visiting, too.